Opinion | Will Trump Fire Rosenstein? It May Not Matter. Something very fishy happened last week. On Friday, we were treated to almost hourly rumors that PresidentDonald Trump’s firing of Deputy Attorney General Rod Rosenstein was imminent. This was to be followed by a scheme to either fire or drastically limit the authority of special counsel Robert Mueller. The cable channels went into overdrive and the newspapers picked up the story. Critics issued dire predictions. And then exactly nothing happened. So what was this about? Piecing this together, it’s clear that at midweek, myold pal Steve Bannonmanaged to get through to Trump, and pitched him on one more trademark Bannon scheme: Fire Rosenstein and cease cooperating with Mueller, citing executive privilege. Bannon also called on Trump to fire lawyer Ty Cobb. This wasfirst reported by The Washington Post, and thenother news mediafound sourcesto confirmthat Trump was livid and that the plan was under very serious consideration. But Rosenstein is still there, and so is Mueller. On Sunday morning, White House press secretary Sarah Huckabee Sanders said she wasnot awareof any plans to fire either. A prime source of the leaks keeping this tale alive was surely Bannon himself. He evidently hoped to jam Trump into going along with the scheme. I have not been able to confirm this with Bannon ― he no longerreturns my calls ― but this is his signature modus operandi, and he went on the record with the Post to kick it off. But as often happens with Bannon’s grand designs, this one backfired. Dithering Republicans, including several senators, were quick to send clear messages to Trump that this move would mark the beginning of the end of his presidency. For the first time, Senate Judiciary Chair Chuck Grassley (R-Iowa) agreed to fast-tracka bill protecting the special counsel’s independence. And one can only imagine how many Republican senators phoned Trump to warn in private what they have not said publicly. Such a bill is unlikely to pass the diehard pro-Trump House, but the threat to fire Rosenstein and Mueller put the Republican Congress in even more jeopardy, after a week in which House Speaker Paul Ryan (R-Wis.), anticipating a November wipeout, announced that he will not run for re-election. It’s also clear that the few remaining adults at the White House cautioned Trump not to move against Rosenstein. Meanwhile, other events intruded to make the timing of any move against the special counsel even more ill-advised. A mother lode of presumably damaging material on Trump is now in the hands of the U.S. attorney in New York and the FBI, thanks to the recklessness of Trump’s longtime personal lawyer and fixer, Michael Cohen. The likelihood is that Cohen himself will face criminal charges and that many of his dealings with Trump are not protected by attorney-client privilege. Just to add to the complications this weekend, the pile-up of issues facing a president whose trademark is not exactly self-discipline included the bombing of targets in Syria and an apparent180-degree turnon whether the U.S. should join the Trans-Pacific Partnership after all. If ever there was a window when Trump might have gotten away with a Saturday Night Massacre scenario of serial firings, that window has now closed. The damage to Trump himself and to his remaining political support among election-anxious Republicans would far outweigh the gains. Even without Mueller, the investigation fueled by everything that he has already unearthed would live on, whether via the U.S. attorney’s office in New York, the Congress, the Justice Department or any of several state attorneys general. A president with broad political support might have illusions of quashing all such investigations, but Trump lacks that political support. And firing Rosenstein and Mueller would further erode what remains of his political backing, even among Republicans. This also deepens a long-deferred crisis for the Republican Party. Until now, Republicans alarmed by Trump have been willing to go along with him, because he has enabled them to enact longstanding ideological goals such as tax cuts for the rich and massive deregulation of industry. But with Trump flirting with placing himself above the law, Republicans are not only in a moral bind, but in a political bind. Trump’s basic approval ratings stillhover around 40 percent, and part of the conservative base will defend him no matter what. But many Republican leaders and voters consider firing Rosenstein and then Mueller to be a bright red line that Trump must not cross. So Trump is damned either way. If he fires Rosenstein and Mueller, he hastens his own downfall. If he lets things play out, the waters keep rising and soon more details will come out one way or another — which will also hasten his demise. Impeachment is not yet explicitly on the political agenda, but it soon will be. 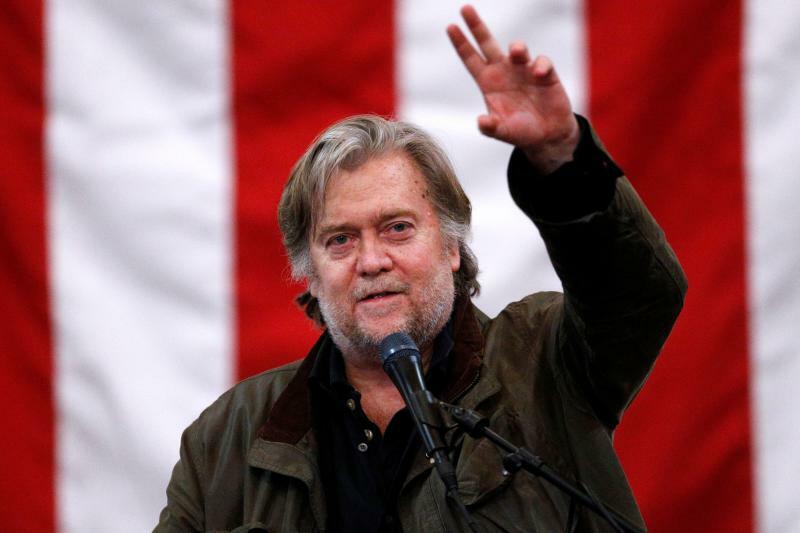 Steve Bannon is the gift that keeps on giving ― to Democrats. Moreover, Bannon and Trump are right about one thing. The “deep state” ― the layers of federalism, the separation of powers, the basic integrity of courts ― are not going away. Trump can’t take over them all. Trump’s impotent lashing out is a sign that he’s cornered, and he knows it. Robert Kuttner is co-editor of The American Prospect and a professor at Brandeis University’s Heller School. His new book isCan Democracy Survive Global Capitalism?